The Center draws on the wisdom of the world's religions to address issues of economic justice. The Center addresses questions such as: How do the ideologies underlying market capitalism(s) compare to and contrast with religiously diverse perspectives on the economy? Can the world religions help to illuminate what values a moral and just economy would serve? 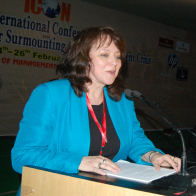 Director McGraw spoke on the topic “The Moral Economy in Global Perspective: Protestantism, Confucianism, Islam, and Hinduism" at the School of Management Science’s International Conference: Spiritual Paradigm for Surmounting Global Management Crisis, Varanasi, India.